A calf strain is caused by overstretching or tearing any of the 9 muscles of the calf. Calf strains can occur suddenly or slowly over time. It leads to sharp pain in the back of the leg with walking and standing, a feeling of tightness in the calf area, weakness in the calf especially noted with activities that require you to rise up on your toes such as pushing off, tenderness to touch in your calf muscle, muscle spasms in the calf muscle, and a throbbing pain at rest. The Physical Therapists at Apple Physical Therapy will design a personalized treatment plan specific to you and your injury that will include range of motion, stretching and strengthening exercises to improve mobility and strength in your calf, ankle, knee, and core musculature to allow you to return to normal daily activity. 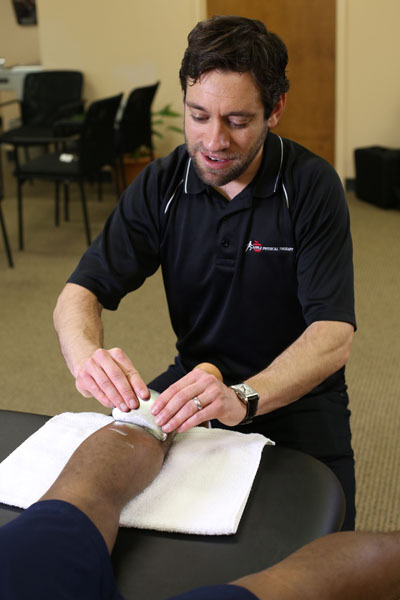 We will include manual therapy techniques such as massage and stretching of the calf and surrounding muscles to restore normal motion of the leg and to facilitate healing. If necessary, your PT may elect to use modalities such as ice, heat and/or ultrasound to decrease swelling, pain and ready the body for exercise.